Serving those who value the connection between food, their families’ health, and the environment has always been a primary focus for Mississippi Market. The ongoing success of ours and other co-ops has helped pave the way for better practices in how food is produced, distributed, and marketed. Mississippi Market opened on the corner of Saint Clair & Pascal on March 1, 1979 with the mission of providing healthy, unprocessed food to the surrounding neighborhood. 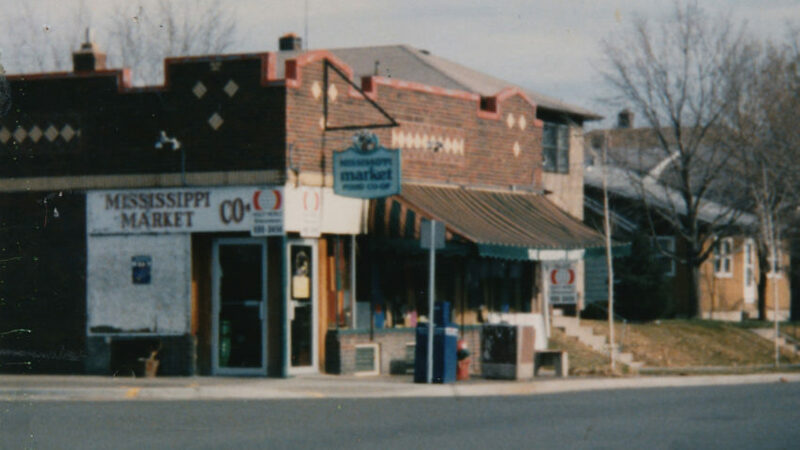 The St. Paul community responded favorably to Mississippi Market, and by the late 1980’s the co-op had outgrown its space. In 1991 the co-op moved to its next location near the corner of Randolph & Fairview, more than tripling its retail space from 1,100 to 3,595 square feet. Organic and natural foods sales boomed in the ensuing years and our co-op’s sales grew apace. Strong sales growth over this period led Mississippi Market to open a second store in April of 1999 at the corner of Selby & Dale, although it wasn’t without its challenges. The Selby store has 7,100 square feet of retail shopping space and includes a complete grocery selection from produce to meat & dairy, a wellness section, and a full-service natural foods deli and juice bar. The Selby location’s second story houses the co-op’s administrative offices and several neighborhood-based non-profit organizations. In 2003 the co-op’s board completed a sale-leaseback agreement of the Randolph location with nearby Saint Paul Academy. We then focused on building our financial strength for future expansion opportunities. Our preference was to find a location that would serve the community served by our Randolph store. As time went on and extensions to our lease grew shorter, it became clear that we needed to broaden our search. In March of 2008 we signed a purchase agreement for the 1500 W 7th Street property and began planning for the new store, which opened in July of 2009. With member-owner suggestions to include sustainable building features and a community gathering space, we worked with a LEED-certified architect to design our store to include green features that we estimated would meet the requirements for a LEED Gold level building. The 7,700 square foot store includes a full-service meat & seafood counter; a deli, juice, and espresso bar; an indoor seating area for 30 people; an outdoor patio; and an indoor classroom. After years of fielding requests for delivery, Mississippi Market launched a delivery service in September 2012. Mississippi Market At Your Door delivered organic, local, and sustainable high-quality products to nearly 50 zip codes in the Twin Cities for four years. Unfortunately, due to rising costs, the delivery program was ended in late 2016. In September 2011, Sarah Geving and Beth Butterfield held a community meeting with 100 attendees and formed a steering committee. As a result, the Gateway Food Initiative (GFI) was established with the East Side Neighborhood Development Corporation to support healthy, local food programs and to hold funds earmarked for a co-op on the East Side of St. Paul. In April 2012, the Gateway Food Cooperative (GFC) was incorporated and the co-op began accepting member-owners. Shortly thereafter, GFC approached Mississippi Market about the challenges of starting a new co-op and the idea of Mississippi Market investigating a potential third store location. By May of 2013, Mississippi Market entered into discussions with the city of St. Paul to explore the vacant lot known as the Hospital Linen site at 740 East 7th St. In January 2014, GFC members voted to dissolve their co-op and become member-owners of Mississippi Market. A month later, Mississippi Market member-owners invested over $1.8 million in the East 7th Street store. Mississippi Market’s third store opened in September 2015.